Where Is The World’s Largest Auto Plant That Was Built From Scratch? Japan? No. Germany? No. Detroit? No. Mississippi? You Better Believe It! - Mississippi Believe It! Home » Resources » Campaign » Where Is The World’s Largest Auto Plant That Was Built From Scratch? Japan? No. Germany? No. Detroit? No. Mississippi? You Better Believe It! A once-barren, 1038-acre field now bears a plant that the world would envy … in central Mississippi. Yes, Mississippi. A state known for its agriculture now cultivates plants of a different sort. The automotive sort. In May of 2003, Nissan started production at the company’s $3.2 billion assembly plant in Canton. The 4.7 million square-foot facility has the capacity to produce 450,000 vehicles a year. Nearly a half-million automobiles a year. Right here in Mississippi. 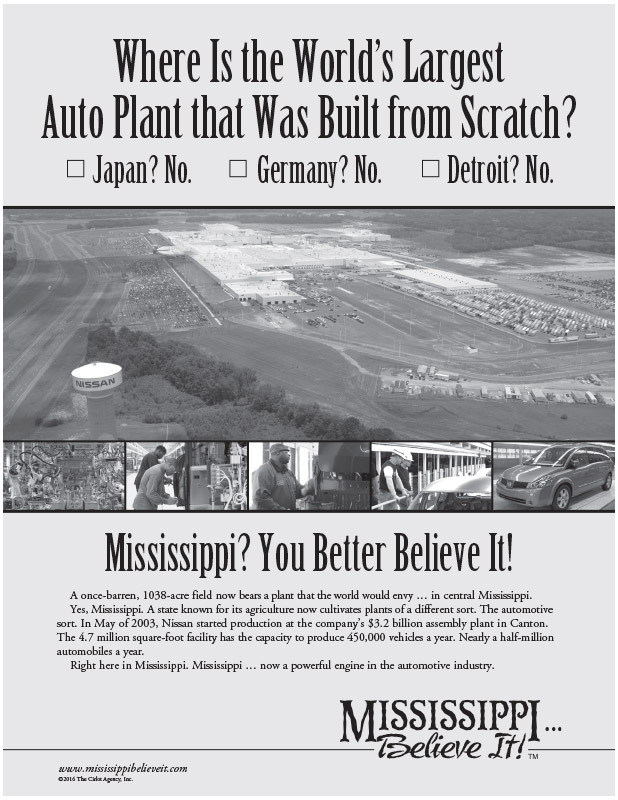 Mississippi … now a powerful engine in the automotive industry.